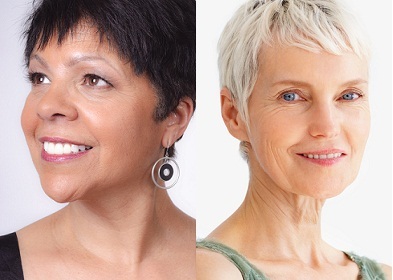 Many women have managed to look more youthful with age. Taking care of your skin, and embracing the natural changes that are bound to happen goes a long way to preserving a youthful demeanor. Although the process can't be stopped, this doesn't mean you can't look good while growing older. You can also strive to prevent premature ageing, or slow it's appearance. Anti aging makeup won't stop the effects of time, but will complement the skin you have now. Here you'll find out what to look out for when dealing with the signs of aging skin. What Causes Skin To Deteriorate With Age? There are two causes linked to aging, although no one knows exatly what causes these skin changes when we age. The first is the natural process that we go through because of time. Then comes the external, environmental factors that we are exposed to. How fast or slow does the natural ageing process go? This is governed by your genes. Known effects are that skin loses bounce and suppleness, because it produces less collagen and sebum.This leads to it being dry, and so wrinkles form. 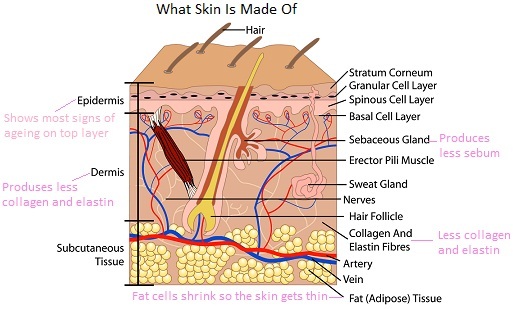 Skin also becomes more fragile because of thinning. So you need more protection from the elements than before. This means that you then have to be more gentle when cleansing, moisturising, and applying your anti aging makeup so as not to rub too much or tug on it. It also means you have to be more vigilant with the sunscreen. External factors include sun exposure, and lifestyle habits. Harmful ray exposure can cause free radicals, and 'age spots'. Bad habits like smoking, bad nutrition, and stress will take away from the good functions of your skin. What can your anti aging makeup do for you? It can even out the skin tone, and bring some colour and and vibrance to dull looking skin. Remember though that makeup is temporary. If you want your skin to stay healthy, it's best to cultivate healthy habits as early as possible. I've recently taken up a lifelong habit copied from my grandmother( she has great skin!). And it's drinking a huge glass of water or two before I go to bed. I don't know if it's my mind playing tricks on me, but my skin is looking radiant! So go ahead and drink water... Feed your body, and therefore skin, with nourishing food. Slather on the right moisturiser and sunscreen for suppleness and protection, and exercise on a regular basis to stimulate those cells. Now turning to the labels on your makeup, there are a few ingredients that will help in keeping your skin looking good. When checking for these ingredients, the best sign that you can look for to see if they're in a high, effective concentration( besides calling up the company to make sure...) is to check how high they are on the anti aging makeup ingredient list. This is because ingredients are usually listed in order of concentration in the mixture. Sunscreen will protect the skin from harmful rays that can penetrate it and help form free radicals. Anti Oxidants are mostly in the form of vitamins such as Vitamin A, C, and E. They help to stop free radicals from destroying skin cells plus they'll nourish your skin. You'll find that these are very common in anti aging cosmetics. Pro-Xylane is a sugar protein that helps stimulate the molicules that hold water in the cells. This keeps skin plump as a result. Peptides are proteins that tell your skin that it has lost collagen and needs to make more. The most common peptide in anti aging products is palmitoin pentapetide or matryxil. The peptides also work to help get rid of damaged collagen. Hyaluronic Acid(HA/ Hyaluronan) is already present in your body, and decreases with age. It keeps skin hydrated by holding in moisture between cells. There's no proof that the amount in anti aging makeup can make a difference to your skin, but in concentrated amounts, it can be effective. That's why it's sometimes used as an alternative wrinkle or lip filler over botox. Alpha Hydroxy Acids(AHA's) work as exfoliants on damaged skin. Remember though, to always use sunscreen when using products with AHA's. Don't confuse them with Beta Hydroxy Acids, which work better on oily skin. Rather than in anti aging makeup, which is meant for drier types of skin. Light reflectors sit on the skin, and bounce light off it. This gives you a bit of a glow and detracts from wrinkles. You can find them in foundation, or highlighters that you can dab on strategic sections of you face like cheeks, chin, and nose bridge. With age, the lids may begin to droop, plus the skin bacomes thinner. So the application technique and tools for your eye makeup have to change. When you've been doing your makeup a certain way for a long time, its easy to end up with an outdated look. It's even easier to disregard the little changes that you've noticed creeping up on you. Make no mistake though, changing your makeup does not mean looking older. This will actually keep you updated, and make you look and feel more youthful and fresh. After cleansing the skin within your anti aging skin regimen, moisture is critical. A moisturiser with skin nourishing properties prevents it from drying out during the course of the day, and this means less pronounced wrinkles. The next step is a quality primer and concealer. Primer creates a layer on top of the skin that fills in fine lines,and pores. This prepares a smoother surface for your other makeup to go on to. Concealer is for blemishes that you really really want to get rid of. Use very little of it on necessary places. Don't forget to keep in mind the right undertone and texture for your foundation. 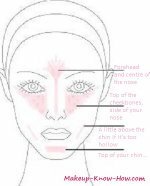 Blush is an anti aging makeup feat in itself! Please don't just draw a line across them! This goes beyond ageing. It's more in the 'tackying up' category. Start with eyeshadow after moisturiser and concealer for any under eye circles. Blend lightly from the inside out, using dabs and avoid pulling on the skin. A shadow with a nice creamy texture is best when applying it onto dry skin. To line the eyes it's best to keep it clean. 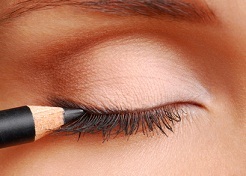 Apply a soft pencil liner on the waterline on your top eyelid, just under the lashes. You can stop here if you want, because this gives you enough definition, plus it elongates your lashes. To take it further, carefully make a crisp line above the lashes, and get as close as possible to the lash. Then blend it out with a brush. Making it a bit thicker on the outer edge of the lid makes the eyes really stand out. Then definitely top the whole thing off with generous lashes of mascara. Mind you, not so generous that the lids look heavy. Two or three coats of a 'volume enhancing' mascara should complete the magic! For more eye makeup looks, check out some techniques for applying anti aging makeup on hooded eyes, while still keeping in mind the right products and techniques for anti aging makeup effects. To prepare the lips for some juicy lipstick, moisturise with a good balm of your choice. Vaseline is also a good lip balm... A trick you might try for a lip lift, is to line the outer area with concealer. Then line the lip with a creamy testured pencil liner that is the same shade/ as close as you can get to your lipstick shade. This will help define the lip a bit more, and keep the lipstick from seeping into any lines. If you're going for a neutral lipstick colour remember that this is NOT the colour of your skin. Choose a colour that is the same colour as you lips. Top it off with some clear gloss and you're good to go!